Designed primarily for middle school students and funded by FEMA and the NWS, this module creates a scenario to frame learning activities that focus on hurricane science and safety. Versions are also available for hearing, motor, and visually impaired students, as well as Spanish-speaking students. Over the course of seven days, Hurricane Erin forms in the Atlantic Ocean, crosses the Florida peninsula, and then makes another landfall at Fort Walton Beach. During these days, the learner is introduced to many basic concepts of atmospheric science, climate, and geography, while also learning some important and possibly life-saving safety and preparedness skills. 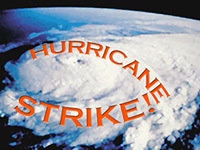 The module includes several interactive games and activities that address hurricane meteorology and hurricane safety. Teachers and others who use the module for public education will find the "Information for Teachers" section particularly useful. This section provides information about all of the main learning objects in the module, as well as access to them as stand-alone activities. Links to numerous hurricane-related Web sites are also included, as are links to expert advice about helping children deal with trauma. Worksheets that test the learner's understanding of the module's content are provided in this section. Students access a different worksheet each day on the "printer" in the scenario's home office. this lesson is so helpful to knowledge most important things about hurricane how is form, where is going, and which area favorable for the hurricane. the lesson explain it with nice and easy way. It was fun and informative. I learned things I did not know about Hurricanes and now I know a little better about how to prepare for one should I ever live where they strike. Young Children would especially enjoy it.